These reasons are insane. Period. Thanks for posting it, Gloria. The most outrageous reason for induction I’ve ever seen was “spotting in a previous pregnancy”. Might Open Perineum? Method of Payment? Mother of Pearl? Ugh, that makes my head hurt. I think it’s so sad that so many women subject themselves to their doctors’ whims without bothering to do any research on the most important event of their lives, and their babys’ lives. How many botched births could’ve gone smoothly if the mother had spent even an hour informing herself? All of the things that the women are communicating show a complete lack of understanding of what’s going to happen to them and their baby. Looks like “informed consent” or “informed refusal” is not happening at all in these cases. Women who don’t speak English as a first language seem to be especially vulnerable to assembly line treatment. I think my *favourite* is “History of rapid labor ……. (this was for a first time mother)”. To answer the question of “Why do so many women use it?”…..”it” being castor oil for induction…. (implying that if so many women use it, it must be ok)….. 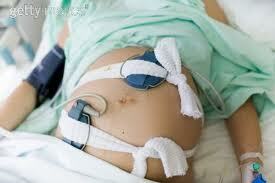 Many women do many things that are not the best idea during pregnancy, birth, and postpartum. In fact, most likely MOST of the women in the US do many things that are unhealthy during pregnancy, birth, and postpartum–the routine use of u/s scans, and weight control during pregnancy, and the high rate of inductions would be just 3 of dozens of possible examples. Just because a practice or intervention is frequently used does not mean that there is any good reason, or scientific basis, for using it.